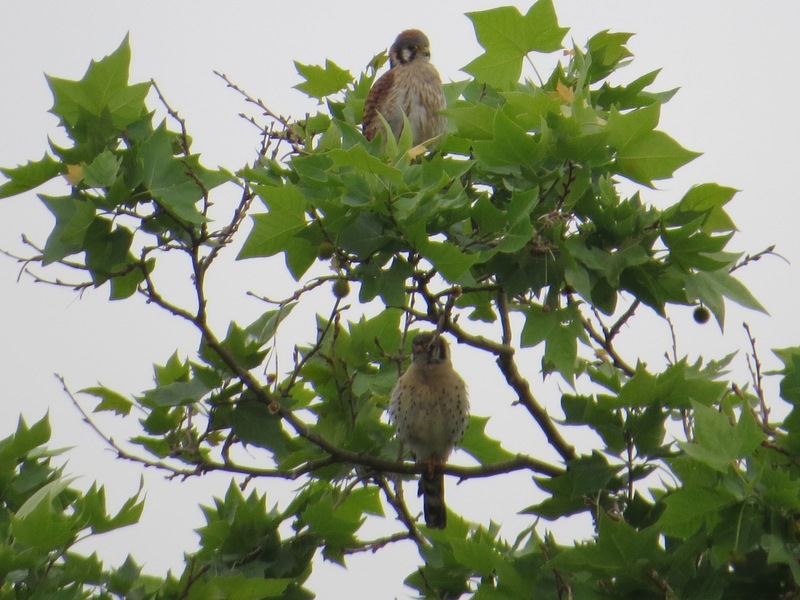 Chasing crows and being chased by crows, our American Kestrels pause briefly together in the late breeding season. There should be youngsters in the cornice nest, but there’s been no external sign of them with these eyes yet. A very quick search for kestrel cavity nest cams in the US turned up little this season, but: here’s a nest cam in the UK, with Common Kestrels. Interestingly, although they look rather similar, American Kestrels (Falco sparverius) and Common Kestrels (F. tinnunculus) aren’t nearly as related as American Kestrels and Peregrines (F. peregrinus) are. The trio of new Peregrines at 55 Water Street are on the edge of fledgling. Great photos and I enjoy the fact of Kestrels in the city. My nest box had one just hatched kestrel nestling and 4 eggs.